A few weeks ago, at the Blakely Rock Race in the Puget Sound, a crew member fell overboard but was quickly rescued with the aid of a few other boats. Marek Omilian, skipper of the Sonic, saw the man overboard and his crew started preparing their MOM. The Sonic dropped their MOM to the victim, who was able to grab it and another boat pulled the victim on-board. This quick rescue is credited to the preparedness of the crew on the two boats. Omilian has prepped his crew with “safety procedures ad nauseum” and they immediately responded when they saw the man overboard. Getting additional flotation to the victim. Once you’re back in the water, regularly practice a man overboard drill so that all on-board are familiar with the correct process. 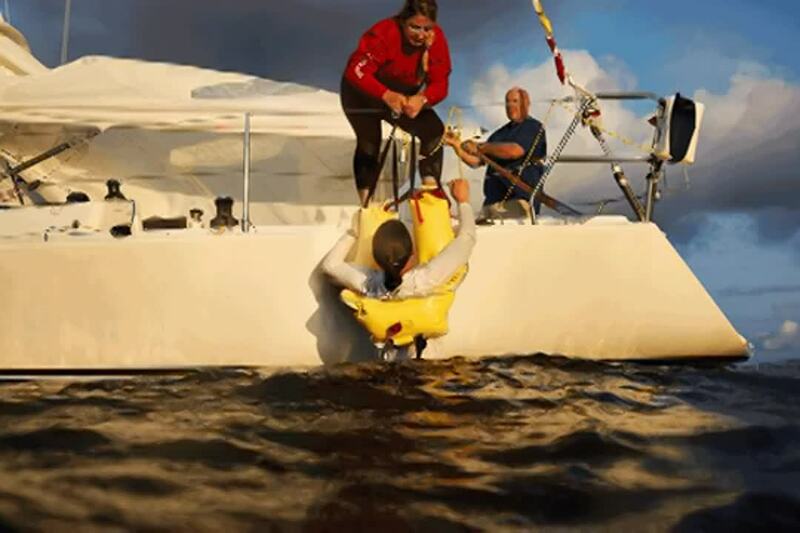 Show crew where your man overboard recovery equipment is located and demonstrate how to use it. Every situation will be unique but practicing will create a routine and mitigate some of the unknown. When a man overboard situation occurs, you want your crew to react like the well-oiled crew on the Sonic.